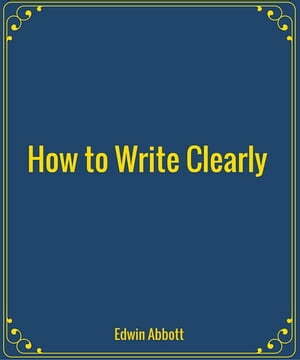 Collins Booksellers - How to Write Clearly by Edwin Abbott, 1230001293425. Buy this book online. How to Write Clearly by the English schoolmaster and theologian, Edwin Abbott Abbott.He is best known as the author of the novella Flatland.Edwin Abbott Abbott was the eldest son of Edwin Abbott (1808–1882), headmaster of the Philological School, Marylebone, and his wife, Jane Abbott (1806–1882). His pa John's College, Cambridge|St John's College]], Cambridge, where he took the highest honors in classics, mathematics and theology, and became a fellow of his college.